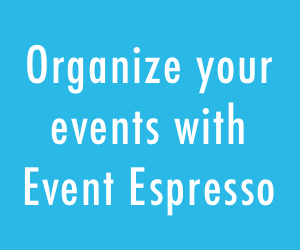 Another stable version of Event Espresso is available to download. We recommend you upgrade now. This upgrade includes the improvements made in version 3.0.18. Added two columns to the attendee overview in the admin area. One column shows the price/ticket option, the other shows the time of the event chosen. Removing from beta. Everything seems to be pretty stable for most users. Fixed a lot of potential problems with the language files. It seems some of the translations had return and new line breaks (\r\n) in them. This seems to have caused lots of problems for international users. Hopefully removing these pieces of code and formatting the text located in the translation functions will fix this problem. There was still a problem when registering attendees from the same computer for free events or when payment was not finalized (ie. downloading an invoice or paying by check.) This has been fixed in the gateway files and template files. If you are not using the default payment gateways or templates, you will need to make sure these are updated. Attendees with a ‘Pending’ payment status are now counted as a paid attendee.Added the payment_overview.php template for displaying payment information after a payment has been made or if clicking on the payment details link. This will also display if the attendee chooses to pay using cash or check payment option, provided they click the new ‘finalize registration’ link, if these modules are active. Clicking the ‘Download PDF Invoice’ payment option will now mark the attendees as pending. Added a ‘finalize registration’ link when using cash or check payment gateways. Clicking the ‘finalize registration’ link will mark the attendees as ‘Pending’ in the payment overview. Added filters for displaying events and attendees in the Event Overview page. Filter events by month/year, category, active/inactive/deleted status. Ability to show all, today’s, and this months events. Filter attendees by month/year, category, payment status. Search by email address, name, transaction id, payment type/status, etc. Ability to show all, today’s, and this months attendees. Fixed emails not showing the right information for attendees and additional attendees. As long as the primary attendee updates the additional attendee data, it should display the custom questions properly. Fixed the bug when multiple people register from the same computer, for the same event, the previous record was deleted. As long as everyone goes through the entire process and pays, the previous wont be deleted. When registering for free events the registration is now finalized and does not delete the old record when using the same computer to register for the same event twice. Fixed an error in the email.php. Was missing an ‘>’ in one of the array variables for the address on line #126. Added the option to choose the amount of events to display in the admin dashboard. great looking updates, but I’d really like to see an easier update/upgrade process sometime down the road. I realize it is a premium plugin, but my clients/your direct customers, expect a push button upgrade. That may not be possible via wordpress without some sort of activation key system, but is there some way inside the plugin this might be accomplished? We expect a better upgrade system too that is why we are working on it. To get it done quicker it would require that we slow down feature development until that was finished. What would be your vote? Stop features and build the push update system or continue feature and work on the push update system gradually? And what is your position? Are you an: event manager or developer?